The band Choozy Music had its beginnings in Rapid City, South Dakota, in 1974. Original members Will Prines, Vesta Wells Prines (now Johnson), Tom Sitzler and Bob Stickel played pop/rock chart hits that were danceable and entertaining. Crossing over genres was a main theme: a current rock hit, an R&amp;B tune, maybe a country classic, a big band favorite, then a rock’n’roll classic song. The rotation of good music appealed to a wide audience. Choosy Music performed across the country at clubs, dance halls, colleges, street dances and events large and small from 1974-1978. 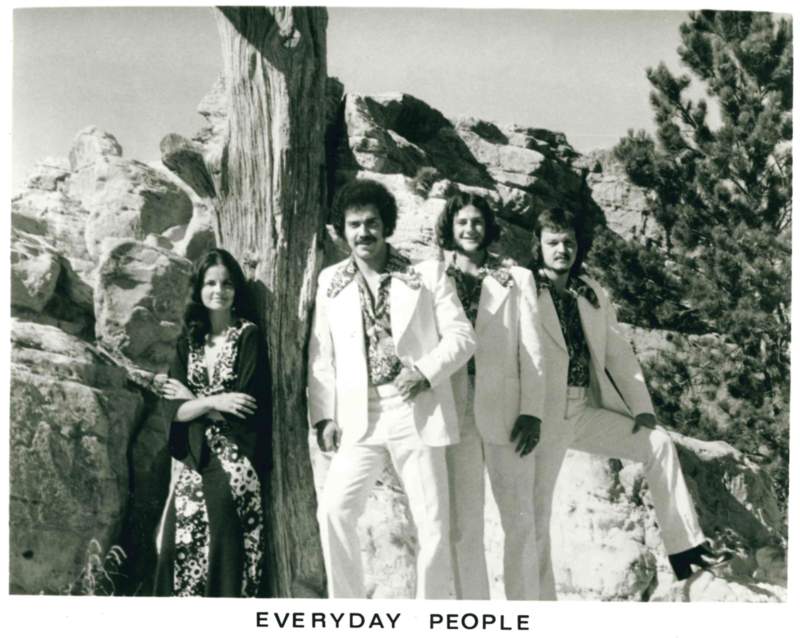 From 1973-1974, the band performed as the trio Everyday People, a Las Vegas style lounge act. When Bob Stickel joined on guitar, the band added more rock with a focus on radio hits and some original music. Focusing on current music proved successful, garnering more places to play along with more and younger audiences. The band added five or six current hits and the occasional original song each week, keeping up with club owners and audiences who demanded more of the latest music. Choozy Music performed through about 15 states, crisscrossing the country from their Sioux Falls home base, from Michigan to Kansas, from Wyoming to Indiana. The band worked with booking agents in Los Angeles; Minneapolis; Chicago; Lincoln, Nebraska; Little Chute, Wisconsin; Omaha, Nebraska; and Lawrence,Kansas. Memorable road experiences included trying to get from job to job during the notorious gas shortage of the ‘70s; alternating New Year’s Eve sets with a big band in a Quincy, Illinois, ballroom; and having to turn down a month-long job at a Virgin Island beachside resort because the band would have to travel during hurricane season. It was an exciting time to be playing music, meeting new people and seeing much of this great country. appeared on the south wall – a stage that was used for several years until it was built out to accommodate bigger bands with more gear. After a successful run and several re-bookings, the Pomp Room’s Duane and Jeannie Ertz asked Choozy Music to stay for a little over six months, June through December 1976, as the house band. The band happily agreed as the Pomp Room had become like a second home and many fans came to see the band there. Choozy Music stayed busy touring and gaining a following. One of their most requested original songs, “Are You Ready,” received air play in the Midwest. The band released a tape of cover songs, simply titled “Choozy Music,” recorded by Bill Van Dusen at UA Recording in Sioux Falls. Choozy Music band members: Will Prines: vocals, keyboards, guitar, alto and tenor sax, trumpet; Vesta Wells Prines (Johnson): vocals, keyboards, cornet, melodica, percussion; Bob Stickel: guitar, vocals; Tom Sitzler: drums, percussion, vocals. Additional band members: Duck Dunlap: guitar, vocals; Butch Zierath: bass, vocals; Gary Broekmeier: guitar, vocals. The band has lost Bob Stickel and Gary Broekmeier to medical issues. We are honored by our induction into the South Dakota Rock and Roll Music Hall of Fame.